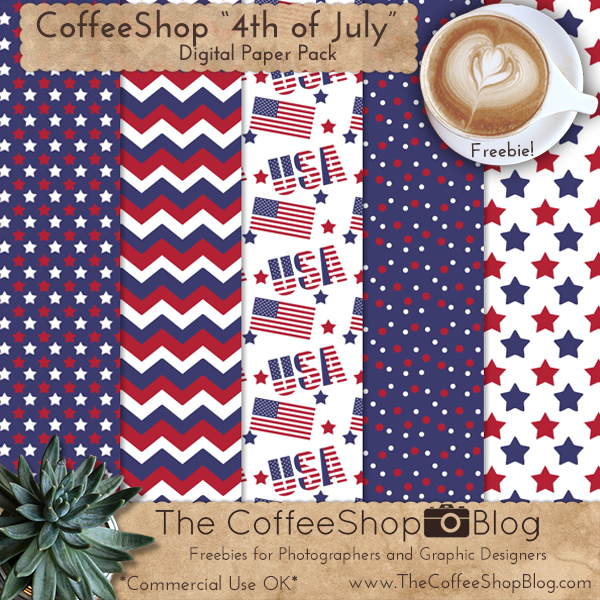 The CoffeeShop Blog: CoffeeShop "4th of July" Digital Paper Pack! CoffeeShop "4th of July" Digital Paper Pack! I hope everyone had a great weekend. Today I have a brand new free digital paper pack inspired by the 4th of July! These would be nice on storyboards, cards, Facebook covers, or printed out. I hope you enjoy playing with them. Download the CoffeeShop "4th of July" Digital Paper Pack! I love these! Thanks so much, Rita! Thank you Jill, you are so welcome!!! Apparently great minds think alike. ;) I was planning on either doing stars or chevrons for my Independence Day digi paper freebie. Actually, originally I was going to do the Canadian flag for Canada Day coming up on July 1st and then the American one for the 4th but I recently found out that the Canadian flag is a copyrighted symbol of the gov't. Go figure! So then I thought maybe I'd just use the maple leaf (believe it or not the specific leaf used on the flag is also a protected symbol, though one can use it, one can't claim it exclusively) and the stars for the US one. Though I better make my mind up soon! That is great Lisa! And you can't use the Canadian flag in designs? Wow! You are so welcome crafterab!